One thing that MakeUseOf does not cover in great detail are Nokia phones that use the Symbian operating system. Often we write about the iPhone, Android and Windows Mobile, but never Symbian and Nokia. On a recent poll that we conducted, Symbian was the 4th used phone by our users, and the 3rd most used Smartphone. So today, this post will be dedicated to everything Nokia and Symbian. For those people who are wondering what the heck I am talking about, Nokia is a leading phone manufacturer in many countries, and especially in Australia (where I live). Most of the new Nokia mobile phones are using Symbian as their operating system which the recent version is known as S60. If you want to find out more about Symbian, you can visit The Symbian Foundation Community web page or read about the Symbian OS and the Symbian platform on Wikipedia. Now that the history is out of the way, I can focus on the main point of this post – mobile phone software for your Nokia. Just like the well known Apple Store, Nokia’s store is called the Ovi Store. If you are a Nokia user (I have the Nokia 5800 XpressMusic and the E71), you may find that Nokia doesn’t have many great apps, however there are a few that do stand out. Ovi Maps used to cost more than $300 for a one year license, but recently Nokia made the application free to a number of devices. So if you have a compatible handset with GPS, you should definately give Ovi Maps a go. Instead of spending a few hundred dollars on a GPS device, just buy a Nokia phone and you’ll get free voice navigation for life – that’s what I did. However, the only downside to Ovi Maps is that it can take quite a few minutes for it to pick up a satellite signal. So if you need to know where you are quickly, but don’t really need voice Navigation, you should also try Google Maps. Ovi Maps also offers a number of other services such as live traffic updates, weather, and other things. The below image is a screenshot of the Ovi Maps home screen. Google Maps usually pinpoints your location within seconds, unlike Ovi Maps. Google Maps for your S60 device doesn’t offer anything special compared to what you get on the browser version, but if you get lost or want to find directions to a place near by, Google Maps is the way to go. However, if you want voice navigation, Google Maps won’t do that for you on your Nokia phone. If you’re tight on mobile internet data, I would suggest using Ovi Maps as the maps are installed on your phone, unlike Google Maps where you have to download them each time you use it. WLM for Nokia was only released a couple of months ago and only works on a couple of devices. The 5800 XpressMusic isn’t one of them unfortunately – however I found a version on the Internet somewhere else and it works like a charm. (I can’t find the website where I got it off, if I do, I’ll post it in the comments). You can however download it from the Ovi store on some models. If you use Windows Live Messenger on your desktop, you must get this app for your mobile – it’s just full of features and very easy to use. If you use Skype, Twitter, Windows Live Messenger, GTalk, Voip and other services, you must install Fring. Fring contains all these services plus more. It’s like your entire IM clients all packed into one small box. However I found that the quality of the voice calls are not as good on Fring as they are on Skype, and for Windows Live Messenger, you can’t show your contacts by email. Although I don’t use Skype much, it’s a great app to have on your phone. Especially if you have a large dataplan, you can get away with cheaper calls (if you have Skype credit). When I tried it out on the Skype Call Testing Service connected to my WLAN network at home, the call quality was pretty reasonable and it used about 2-3 kb/s on the call which isn’t too bad. If you have the XpressMusic phone, you will know how bright the flash light is on the camera. So to make good use of this camera’s flashlight, install BrightLight. Just flick the switch and your light is on. It’s a really good substitute for a torch. If you don’t need a bright light, FlashLight is a useful app. Basically you can set the colour for your entire screen, whether it be white, red, blue, yellow, pink or green – any colour you want. I use it all the time for sneaking around the house because it produces enough light to see where I am going and not too much where it will wake everyone up (like BrightLight does). If you want to see how much energy your phone is using, or the transfer rate of your mobile internet, Nokia Energy Profiler will do the trick and a whole lot more. If you had been wondering how I have been taking the above screenshots on my 5800XpressMusic, I have been using ScreenSnap. It’s really simple to use, just run the application and press your phones camera button and it will take a screenshot of your phone. What Are Your Favourite Apps? The above are my favourite mobile phone software apps for my Nokia S60 device. Have I missed out on any that should be in the list? If I have, please let me know in the comments. Also, if you think Make Use Of should cover more posts about Nokia and Symbian; please say so in the comments. I have to agree with Flavio...Nimbuzz is better than Fring in many ways. It doesn't seem to use as much resources as Fring and handles all my IM, VoIP and SIP accounts. I would recommend too. but after all that, I'm still moving to a HTC Android on next purchase, I wonder how many are thinking the same thing...? Hey friends, can anyone help me because i m nt able to access ovi maps on my nokia mobile evn when there is no problem with my network..
nice post thanks for sharing most informative post in my point of view its a great blog where people found latest information according to their need and all mobile phones companies like nokia phones,Sony Ericsson Phones and many more . i am very impress with your blog and personally appreciate you again thanks for sharing helpful information to everyone keep it up . Not only marking, but adding photo's to an email. It's like 5+ clicks. The 5800 only has 4 keys though, so you don't have much a choice. I had a quick google and found this: [Broken Link Removed] Sounds like a bit of a pain. Something is wrong with a program on my memory card, because if it's in, I can't switch my phone on and I have to take it out. Sounds like a bit of a pain. Something is wrong with a program on my memory card, because if it's in, I can't switch my phone on and I have to take it out. I use Handy Shell for my Nokia 5800. It's kinda cool! The must-haves are : Opera Mobile, JBakTaskman, X-plore and Mobipocket. Ok, so you got them from other sites. Personally, I don't trust installing apps from third parties - if it's in the Ovi store, it just feels safer. Just trying to determine what's trustworthy and what's not can be difficult. Off memory, QuickOffice is $12.00AUD. I agree with you as well, their isn't many good apps in the Ovi store. Since I have the 5800 XpressMusic, the only way to unlock the phone is with the side button. So if anyone knows of a free app that unlocks the phone similar to the iPhone, please let me know. I did find one, but my phone froze when I was installing it. I can't find much useful stuffs in OVI store, especially the Chinese OVI store, full of useless craps. A lot of better stuffs are not even available in Chinese OVI store although they are free to download in OVI store of other countries. So far, I'm not able to find a way to switch to OVI store to US or Europe even on my computer. 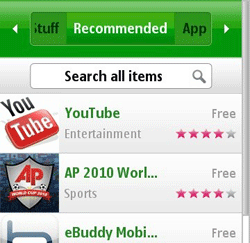 eBuddy is another good program, but I rarely use it. I found Fring to do the trick. Nokia articles have been discussed in the past but were never published unfortunately. Hopefully by the success of this post, Make Use Of may publish more Nokia related posts. As I mentioned about the poll, more MakeUseOf readers use Nokia/Symbian then Windows Mobile and MUO covers more on Windows Mobile than Nokia. Thanks Ars Nova for your the apps that you use. Some of them sound really good. If possible, could you provide download links to them as I can't find some of them in the Ovi Store. I'm glad someone thought of covering Nokia's Symbian OS (I've been a Nokia user for almost a decade). While it's true that the world in general is moving toward Apple and Android, Symbian does have relevance in the cell phone market. That said, I do wish it were more more competitive in bringing out new apps and features. I can live without most of the apps in the post(except Google Map), but here are some I extensively use in my E71. All you have to do is download the newer version of Ovi Maps from the store and you will be good to go. Thanks for your comments and suggestions. I did forget one app which is a really good music player. If you want internet radio, you have to install TuneWiki (can download from the store). It uses Shoutcast services, so if you don't have much memory for all your music, just stream it. It's around 2kb/s, so make sure you do it on WiFi, otherwise you may get a huge phone bill because of the data charges. iOn Battery meter for accurate battery life indication. Add also Qik, Shazam and Bolt as alternative browser. And some plugin for OVI Share, mainly MobyPicture and Pixelpipe, so to be able to share photos with several social networks at once. I used Fring for long time, but lately Nimbuzz got better. Definitely give it a try! I never got into Nimbuzz much, I just seemed to like Fring better. Emoze, Gravity and Opera mini are must-haves. I don't agree on Opera Mini. Sure, it's fast, but while dragging the website through Opera's servers it often removes quite some functionality. I prefer Opera Mobile, which might be a little slower, but at least gives you all the normal functionality. I didn't like Opera browsers compared to the default browser. I found the writing too small so I had to use my stylus. The only thing I liked about it is the scroll rate. Opera's real strength is the compressing technology compared to the default browser. Furthermore, isn't there an option for the font size? - Opera Mobile as my main browser. - PowerMP3 is my music player of choice. - SmartLight to stop Symbian from constantly dimming the light when I least expect it. - QuickMark to read QR-codes. - Gravity as my Twitter client. - Emoze when I really need to check my e-mail. Furthermore I have tried MoBots, which is a very interesting concept, but I don't really have a use for it. Thanks for all your suggestions. For QR Code, I found BeeTagg really good. Jack Cola is an internet geek and technology enthusiast. He loves to write technology related "How To" articles that help people out with common and unique issues.